This may be the most mysterious presidential election I've ever covered. Both candidates are enigmas. Mitt Romney is a traditional political conundrum: he's stood on so many sides of so many issues, it's difficult to know what he really believes. We've seen such candidates before, especially moderate Republicans who try to pander to their party's flagrant base. George H.W. Bush was Exhibit A. But Barack Obama is an entirely unique phenomenon. We know where he stands on the issues. We know his no-drama style. Still, there's something essentially unknowable about him, a protective opacity rather than a slipperiness. He frustrates supporters and opponents alike. In the days after the President's bizarre--there is no other word for it--debate performance, there was an eruption of theories. Some were odious. 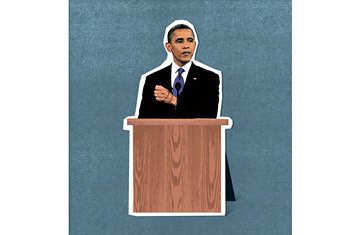 Various conservative commentators offered that Obama was finally disrobed, a mediocrity dependent on a teleprompter. There was a distinct racial tinge to this, I believe. Former New Hampshire governor John Sununu, co-chair of the Romney campaign, called the President lazy, which has more than a little ethnic history attached to it. But Obama's performance was so dreadful that even some liberals, like the comedian Bill Maher, drifted into the maybe-he-really-does-need-a-teleprompter trope. This is beyond foolish, of course. The President is no dummy; he's as well versed in the nuances of policy as Bill Clinton, if decidedly less compelling. Watch him in any press conference. Go back and look at his question-and-answer session with House Republicans after the 2010 election. He knows his stuff. But there haven't been many press conferences--or town meetings, for that matter. His kinder debate critics said he was rusty, which is true, but there's more to it than that. Obama chooses to be rusty. This is also strange: he's warm and informal in person. He enjoys a good policy discussion--and I mean discussion, in which he actually responds to things you say or ask rather than speechifying. In my experience, though, he hates small talk, especially flattery, and that gets us closer to the heart of his current troubles. I am reminded of Obama's relationship with the late Richard Holbrooke, who was--in Clinton's loving estimation--"the world's worst flatterer." Holbrooke was a brilliant diplomat, but he tended to stuff his briefings, and memos, with heavy ladlings of unction and hyperbole. (Unprecedented was a favorite Holbrooke word.) He annoyed Obama no end, but that's a luxury no President can afford--because the art of politics is a honey-and-baloney sandwich. It is undignified and icky, qualities not often associated with Barack Obama. Qualities, in fact, that are utterly disdained by Barack Obama. I am also reminded of an exchange that took place at a town meeting during my 2010 road trip. A man said his mother had just gotten $250 in her direct-deposit checking account and didn't know where it came from. "I checked it out and found that it came from the federal government," the man said. It was money to fill the so-called Medicare prescription drug doughnut hole. "I'm a big Obama supporter," the man continued. "But why couldn't he tell us about that?" Indeed, another politician might have shown up at a senior center with a giant Publishers Clearing House--size check for $250 and a truckload of doughnuts--or some other treacly, transparent emolument.